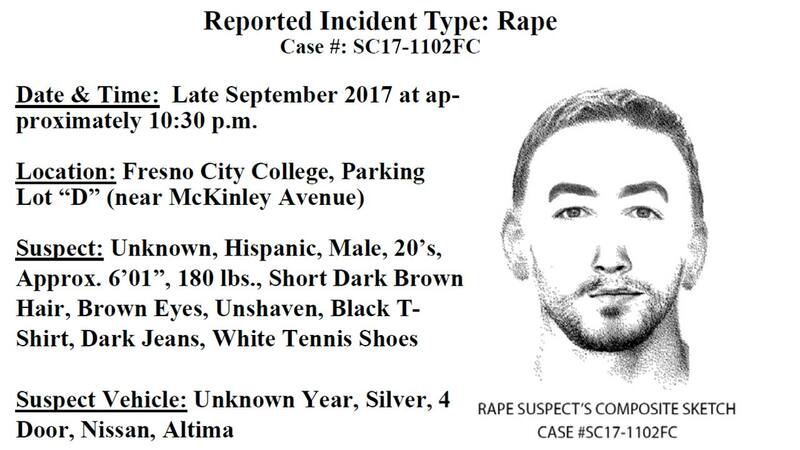 FRESNO, Calif. -- Fresno City College Police need your help in locating a suspect they say raped a female student. The incident happened in late September when the student was walking back to her parked car in lot D, near McKinley Avenue. The State Center Community College District Police Department just issued a press release to the campus community about the incident. She was reportedly dragged into the back seat of a silver sedan where she was sexually assaulted. The State Center Community College Police Department is attempting to locate witnesses. Anyone with information regarding this incident is urged to contact the SCCCD Police Department at 559-244-6140.